Most tourists to Jeju Island come for the UNESCO natural heritage sites, or the rolling countryside, beaches and forests. 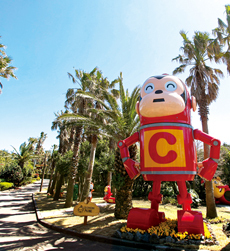 But Jeju has a wealth of other attractions to keep even the smallest tourist entertained for the whole day. There are also great rainy-day options for those grownups who refuse to grow up! One of the oldest, but cutest, cartoon cats in the world, most kids are in love with 40-year-old Hello Kitty. 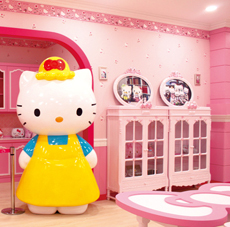 Jeju’s Hello Kitty Island opened in 2013 and it boasts three floors with tons of interactive exhibits to keep every little princess happy, and even a few young princes. and drinks are works of art in themselves. Hours: Summer: 9 a.m. - 8 p.m. This unlikely museum featuring antique automobiles is a perfect choice for boys and girls interested in car technology and history. 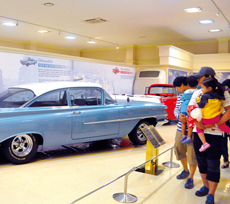 It boasts of being Asia's first private museum and features over 90 privately owned cars dating back to the 1900s, in addition to a variety of other automobiles. The indoor displays take visitors through automotive history beginning with Leonardo da Vinci's 1482 clockwork vehicle up to present day luxury cars by Mercedes Benz, Lamborghini, Bentley, and Rolls Royce. Additionally, the museum offers kids the chance to earn their Kids International Driving License at no additional cost. Tickets: 9,000 won (adults), 7,000 won (13-18 years), 6,000 won (children). * Group discounts available for more than 30 people. 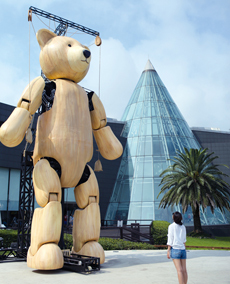 The 2012 TripAdvisor award-winning Teddy Bear Museum is another great location for families traveling in Jeju. The three exhibition halls that make up the museum offer a variety of Teddy Bear experiences. The first hall is a Teddy time-travel journey from the Korean Joseon period through the 1969 moon landing. The second hall features world-famous works of art remade as Teddy bears, including the 240 million won Louis Vuitton bear. The final hall holds annual exhibitions and currently has the theme of U.S. president Theodore 'Teddy' Roosevelt as well as antique bears from the 19th and early-20th centuries. Tickets: 7,000 won (adults), 6,000 won (13-18 years), 5,000 won (children). * Group discounts available for more than 20 people. Ecoparks engage young visitors with the environment and are becoming more popular worldwide. Cocomong Ecopark, newly opened and certified by the Forest Stewardship Council, is set to be one of the island’s most loved attractions as it gains recognition and attendance. and adults to have fun and learn together. Spring (March - June): 10 a.m. - 6 p.m.
Summer (July - August): 10 a.m. - 7 p.m. Autumn (September - November): 10 a.m. - 6 p.m.
- Water attractions open from July 18 till August 31.